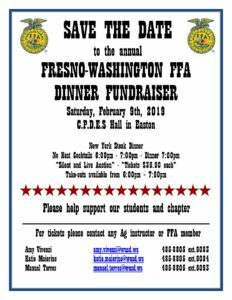 Washington Unified would like to invite all families to support the Fresno-Washington FFA chapter by attending the annual FFA Dinner Fundraiser. This year’s event will be held on February 9th at the C.P.D.E.S. Hall in Easton. Festivities will begin at 7:00 p.m. and include a New York steak dinner and auction. Tickets can be purchased for $30.00 from a current FFA student or instructor. Please contact Washington Union High School at (559) 485-8805 for more information.